Bangladesh skipper Mahmudullah rues for dropping Ross Taylor as he believes that made a huge impact on the rain-shortened second Test at Wellington. New Zealand defeated Bangladesh by an innings and 12 runs in Wellington despite the opening two days were washed out, Kiwis clinched the three-match Test series by taking a 2-0 lead. While Kiwi pace bowler yet again dominated the proceedings with their short balls it was Ross Taylor’s double hundred that seemed to have put them in the driver seat as it gave them a healthy first innings lead. Jayed forced an uppish drive off the first-ball of the over only for the fielder at cover (Mahmudullah) to put down a sitter. To make matters worse, just two balls later, Shadman Islam dropped a chance in the slip cordon. “If we could take those chances, we could have given a better momentum to the bowlers. It may have brought us few more wickets,” Mahmudullah told reporters after the match. “They were playing with seven batters and with the kind of help that this pitch produced for the bowlers, it would have helped our guys,“ he said adding that they need to make sure they don’t leak runs so easily in the last Test. “Jayed, Mustafizur (Mustafizur Rahman) and Taijul (Taijul Islam) bowled quite well but we ended up conceding five runs per over. We have to find ways to bowl better in the next match,” he said. Mahmudullah said that they have to bat with lot more purpose if they want to do well in the last Test and added that he firmly believes his batsmen have the ability to play better. On both the Tests visitors were caught by the pace unit of New Zealand as they began to dictate terms especially Neil Wagner with his short bowling. Since his Test debut in 2012, Neil Wagner, the New Zealand pacer, has bent his back time and again to pepper the opposition ranks with a barrage of well-directed short deliveries and found success. His sustained short-ball tactics once again came to the fore when he dismantled Bangladesh’s batting unit in the just-concluded Wellington Test and ended up with nine scalps in the match. Wagner’s success of using the short ball can be capsulised by the fact that 15 of his 16 wickets in the series have come through his tried and tested formula. The way Bangladesh crumbled against Wagner’s strategy in both the Tests also opened up a slew of questions on their ability to play the short ball. “We have to bat with more guts for longer periods. A number of our batsmen are playing half-hearted shots, or we are not committed. We are in two minds whether to play a shot or not. You need to back yourself. If you want to attack, you should know how you want to cope with their bouncer strategy,” said Mahmudullah. “In the first innings, Tamim (Tamim Iqbal) and Shadman (Shadman Islam) gave us a good start and even after Wagner started with his bouncers, we were handling him well but then we gave it away,” he said. “We knew about him from the last time we were here. This time round we were talking a lot about the Wagner factor. There was certainly help in the pitches for both sets of pace bowlers but we couldn’t utilise it as well as they did. I believe that our batsmen have the skills to handle their short-ball tactics,” he said. Mahmudullah added that they are well aware that Christchurch wicket will be fast and they need to pull up their socks immediately if they want to leave any impact on the last Test, scheduled from March 16. 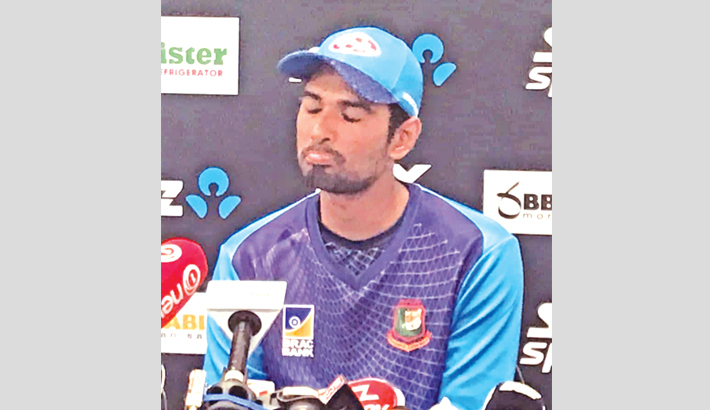 “They will probably have a fast wicket in Christchurch, so our batsmen have to be more responsible, particularly with three new bowlers in the side,” said Mahmudullah. “I think it is the batsmen who should take more of the blame. We were bowled out twice inside two-and-a-half days,” he concluded.